The Health Department is now administering flu vaccine in our regularly scheduled immunization clinics. Click on the icon to the right to see our clinic schedule and locations. The vaccine is $40 and we accept most insurances. Influenza (commonly called “the flu”) is a contagious respiratory illness caused by influenza viruses. Infection with influenza viruses can result in illness ranging from mild to severe with life-threatening complications. An estimated 10 to 20 percent of U.S. residents get the flu each year: An average of 114,000 people are hospitalized for flu-related complications and 36,000 Americans die each year from complications of flu. Gastrointestinal symptoms, such as nausea, vomiting, and diarrhea are much more common among children than adults. Some of the complications caused by flu include bacterial pneumonia, dehydration and worsening of chronic medical conditions, such as congestive heart failure, asthma or diabetes. Children may have sinus problems and ear infections. The flu spreads in respiratory droplets when people cough and sneeze. It usually spreads from person to person, though occasionally a person may become infected by touching something with virus on it and then touching their mouth, nose or eyes. Adults may be able to infect others one day before symptoms appear and up to seven days after getting sick. 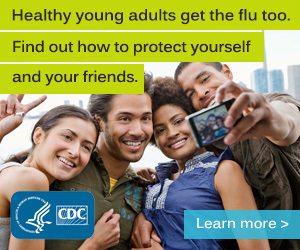 That means that you can give someone the flu before you know you’re sick as well as while you are sick. Simple steps can go a long way in prevention. Practice good hygiene daily by washing your hands often and covering your coughs and sneezes, and consider getting a flu vaccination. The single best way to prevent the flu is to get a flu vaccine each fall.